IN LATE 1983. an elegant and understated LP slipped quietly onto the racks. Produced by Beatles engineer Geoff Emerick, it began with a lush arrangement of swelling horns, while its opening lyrics could have been a manifesto for then-nascent yuppiedom: “Get it, I want it, potentially mine”. 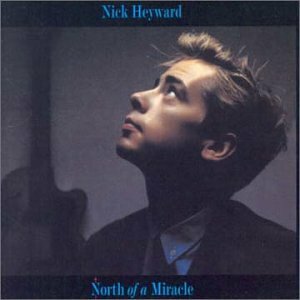 If Elvis Costello had released this album, it might just feature in the lower reaches of those lists of all-time greats; but it was called North Of A Miracle and was made by Nick Heyward , a man known principally for tucking his jumper into his trousers. Few musicians at the time were taken less seriously than Heyward. Although his band, Haircut 100, and their Monkees-meet-Chic groove-pop, was genuinely refreshing when it broke in 1981 (Danny Baker gave their debut album, Pelican West. a rave review in NME on its release in February 1982). a year later there were credibility issues. After enjoying four Top 10 singles. a Top 10 album and some US success, the end, critically and commercially, appeared to be nigh. Tour dates were cancelled and a proposed second album, provisionally entitled A Blue Hat For A Blue Day was scrapped as Heyward announced he was going solo. He felt that, as his group became successful they’d ignored the music and become too concerned with image. Suddenly. the perma-grinning kid in the yellow cagoule had stopped smiling. With occasionally jarring instrumentation (the jazz intro and outro to “The Kick Of Love”, the extensive use of strings), the album creates its own microclimate: permanently autumn. At least half the tracks refer to the cold, or wind, or rain. “On A Sunday” is an oddly poignant paean to leisure time, while “The Day It Rained Forever” and ”CIub Boy At Sea’ are suffused with an unbearable melancholy sixth-sense. Although the album made the UK Top l0 and included several hits (first single “Whistle Down The Wind , “A Blue Hat For A Blue Day’ a typically jaunty “Take That Situation” and‘When It Started To Begin”) Arista decide Heyward's future lay in more conventional settings: within a year he was singing straight upbeat pop like ”Love All Day”. And yet North Of A Miracle endures, echoes of it reverberate though the work of Eric Matthews, The Flaming Lips and the Engineers. Although Heyward today feels later collections From Monday 7 Sunday (1994) or Tangled (1995) are stronger , North Of A Miracle holds a special resonance. Last edited by johnfoyle on Mon Jan 10, 2011 5:15 pm, edited 1 time in total. So, prior to making the record, instead of enjoying the "New Romanticism" vibe, he was was suffering a "breakdown" and ended up "wearing corduroy jackets. Hush Puppies and ties, trying to keep sane" . Ok, corduroy jackets!! So now he makes this great record, as a kind of therapy (to supplement the corduroy jackets). And what was the upshot? Again with the corduroy jackets!! Doyou think Nick would have been happier and more professionally successful if he was less concerned with "corduroy"? The article has a nice title, by the way: Great Albums that Have Fallen OF the Radar. I myself prefer my great albums to fall of the sonar. I dated a girl in high school who had a bit of a thing for Nick Heyward. Fortunately it never went as far as her asking me to tuck in my wooly sweater. I do however remember a hideous paisley shirt. Don't laugh cos I'm serious. I loved North of a Miracle. Tangled was also a great lost album with some real gems. Heyward always comes across as a genuinely nice guy and he's quite an acomplished guitarist. I saw him support Squeeze at the Oxford Apollo in the early 90s and the audience were well impressed with him. I'd love to see him make another record, if only for the way he walked away from being a record company puppet. Hey Jackson, great to see another fan of this fantastic album! This was a must have record for any Elvis fan back when this came out because of the presence of Steve Nieve. That piano on "When It Started To Begin" was unmistakably Steve, and it was very cool. Looking at the track list now, the only song I don't remember playing all of the time is "Day It Rained Forever." This album was a staple at party's and get togethers with my friends for quite some time. Most of the people I hung around with at the time had this record. I think there are some similarities with Imperial Bedroom, definitely, Geoff Emerick had another great album on his hands! My favourite songs are probably "On A Sunday," and "Whistle Down The Wind," But really every song sounds like it comes from "catchy'sville." Nick Heyward was born in our local hospital. alexv - to my knowledge our village was not obsessed with corduroy so he must have picked up this obsession elsewhere. I don't think anyone in our village has heard of corduroy. Even me. VG, I think with Nick and a lot of these pop bands (particularly English 80s "bands") style was confused with substance, and it carried to their entire lives. Nick's quote is consistent with that: he seems to think that if he wore corduroy, and thick glasses that somehow would make him "intellectual" and all serious. Sort of makes dealing with Oxford's demands easy, when you think about it. By the way, my comments are strictly based on the amusing article posted by John. I managed to make it through the 80s without being exposed to Nick. I gravitated to the less style-obsessed music of Culture Club, Duran, Simply Red and Paul Young (I was going to append a "smiley" thingy here but can't do it; anyone know the trick?). Uncomplicated wrote: This was a must have record for any Elvis fan back when this came out because of the presence of Steve Nieve. Then how did I miss it? Re: I think for about two weeks I thought I was Elvis Costello. Nick Heyward and his band Haircut One Hundred were one of the most innovative bands of the Eighties. Their sunshine Pop fused with funk led a whole legion of fans to jump on their funfilled band wagon to experience the delights of a world filled with Lemon Firebrigades, Favourite Shirts and the delicious possibility of Boy Meets Girl. Their album 'Pelican West' is a gem of innocent Pop wonder and much loved treasure of many a forty something teenager. Fine memories of HC100 tours are to some the equivalent of the Charlie and the Chocolate factory golden ticket. Pop Troubadour Heyward went on to a fine solo career starting with the breezy 'North of a Miracle' (1983) album that spawned four hit singles including 'Blue Hat For A Blue Day' through to other solo projects 'Postcards from Home' (1986) and 'I Love you Avenue (1988). The Nineties for Nick included 'From Monday to Sunday' (1993) and 'Tangled' (1995) both through Sony and 'The Applebed' (1998) on Creation. Nick continues writing and will soon release an album of new material. 'Favourite Songs : The Best of Nick Heyward and Haircut One Hundred' is currently available. Nick and Haircut 100 will reunite for this concert in the intimate setting of Cadogan Hall - a Christmas treat. On Vh 1 a while back they had that programme 'Bands Reunited' & Haircut 100 were one of those featured. And they were one where they did reunite and from waht I remember sounded fantastic. The above could be worth seeing if your local.